"Power is not leadership, it is humility and performance that set you apart from the pack." NSW Police Commissioner Andrew Scipione APM holds one of the most challenging jobs in NSW, commanding Australia’s largest Police Force comprising almost 20,000 personnel, and servicing a population of over 7 million people. During his 30 plus years of service with the NSW Police Force, Commissioner Scipione has been dedicated to the safety of the community and upholding high standards within the Police Force. 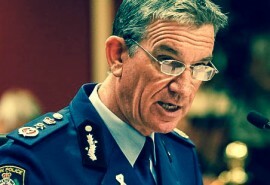 For his commendable service throughout his career, Commissioner Scipione has been highly decorated, including receiving the Australian Police Medal and the National Medal. Before his appointment as Police Commissioner and head of the NSW Police Force, Andrew worked in detective units, the National Crime Authority, and as a general duties officer in some of the toughest parts of Sydney city. Andrew served several years as the Commander of the Special Technical Investigation Branch, before being made Chief of Staff to then Police Commissioner Peter Ryan, and in 2001 the Commander of Special Crime and Internal Affairs. In 2002, Andrew was promoted to Deputy Commissioner. Thank you for your interest in 2020 Exchange. A member of our Client Services team will be in touch within 24 business hours. Sorry, this event has been expired for registration.